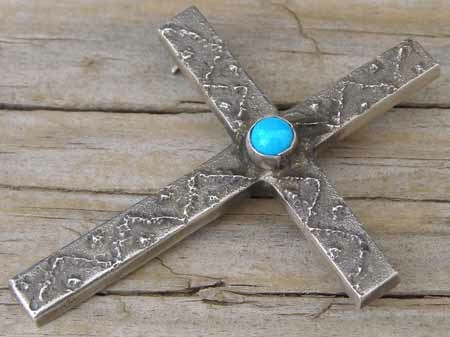 This sandcast cross is made to be both a pin and a pendant.The silver is one-eighth inch thick and has nice heft. Lee set a round of natural, untreated clear blue Sleeping Beauty turquoise in the smooth bezel. We include a leather cord with this so it can be worn as a pendant right out of the box. Dimensions of cross: 2 1/4" x 1 3/4"